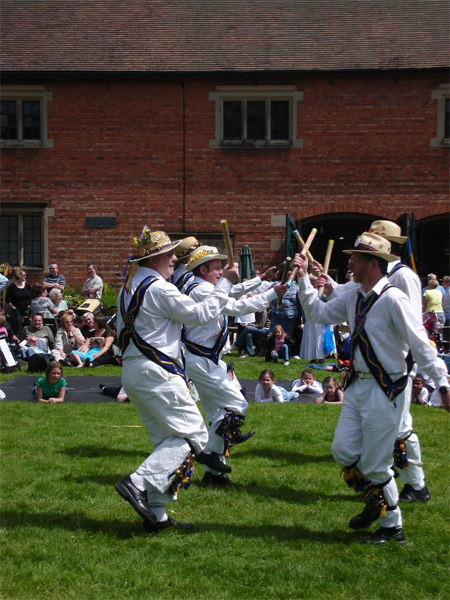 A bit of group history – Morris Dance is the principle English costume and dance tradition. It was old in 1450, when the earliest records mention “Ye Morrys Daunce”. The Uttoxeter Heart of Oak Morris Men may look that old, but the club was formed in 1955 and has been going strong ever since. Main activities – Uttoxeter Morris Men dance mainly the Cotswold traditions, but occasionally venture into the world of Rapper and Long Sword dances and the odd Border dance. The dances, as we perform them are, as near as we can guess, what you may have seen in a Cotswold village in the late19th Century. 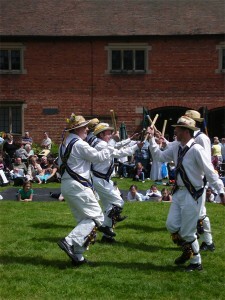 We have our own dances in the style of the Morris Tradition too. We also teach Morris to anyone who wishes to learn, either to join us as a team member, or just for keep fit and interest. Uttoxeter Morris intends to promote and recruit new Morris dancers. We produce a dancing-out programme each year, which we make as widely available as possible and information on our programme of dance is available on our website. Our costume – is white shirt, white trousers with crossed braid (baldric). At the centre of the cross on the front is a heart with oak leaves and acorns. The braid is blue and black with a yellow zig-zag stripe. Membership – is restricted to men only (since we belong to the Morris ring). We have about 25 members. Traditional local events and festival participation – We have danced on Boxing day at noon in Uttoxeter market square every year since our foundation. We don’t normally dance at festivals, just fetes and local venues. We did dance at a Festival in Romania last year.